You possibly have that uncle - you know, that one who declares expertise on world affairs and generously doles out advice on how to run the country. India needs a dictator, democracy is for sissies, he says. And his solution for ending terrorism? Carpet-bomb Syria, of course! Genocide is, obviously, the most sensible, cost-effective solution. Hearing this uncle speak will make you think that exterminating millions of people is akin to purchasing supplies at the wholesale store to save money. Sometimes you wonder, if you were to take this uncle to Syria, place him in the middle of that action, and, even better, hand him the controls for all the bombs, what would he think? Would he still find genocide a cost-effective solution? Would that all-knowing mind of his suddenly discover a conscience in itself? Will he ever be able to look at the newspaper again as light coffee-time entertainment? Now taking him to Syria is a long shot, and getting him into an intelligence agency is a no-go. But what you can do is buy a couple of tickets and take him to watch Eye In The Sky. Colonel Katherine Powell (Helen Mirren) has spent years tracking down an extremist, and finally manages a positive identification in a house in Nairobi. She gets a capture permission from Lieutenant General Frank Benson (Alan Rickman), and is ready to make the attack which is the culmination of six years of her hard work. Then, the drone camera catches on that the extremist and her wards are just about getting ready to leave for a couple of suicide bombing attacks. Colonel Powell is no longer interested in capture - she wants a kill permission. 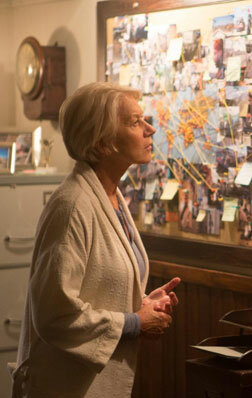 Eye In The Sky painstakingly puts together the kind of decision-making process that goes into a situation like this. International relations, political weightage, logistics exercises, and surprisingly, just the humanity of not causing collateral damage - all of these feature in the process, and lug you into the midst of this ethical quandary that the mission becomes. There is no flashy filmmaking here. It is all purposive. The intentions behind how each scene is crafted become plain as the scene is rolling out. The director does not want you to be distracted from the primary concern of the film - drone warfare and how it attempts to reconcile itself with the ethics and concerns of the people involved. And the most appropriate visuals, music, and, in particular, editing (the story pans across four continents simultaneously, and you almost don't notice the shifts) are brought to serve the script. Both Mirren and Rickman bring the gravitas that their roles demand. Powell, in particular, is a role that could easily have been made to look insensitive but Mirren makes sure you do not question her integrity at any point. And Rickman's fineness is a joy that needs to be watched on the big screen. That, too, considering we won't be seeing much more of him in theatres any longer (RIP). The remaining members of the cast, too, turn in effective performances: Aaron Paul as the conscience-facing drone pilot, Barkhad Abdi as the quick-thinking undercover agent on the field, Lain Gellet as the food-poisoned foreign secretary, and nine-year-old Aisha Takow as Alia the bread vendor who unwittingly throws a nerve-wracking wrench into the works. As wonderful as it is, Eye In The Sky will ask you to exercise the brains a bit much. It can't be taken for simple unsophisticated entertainment. If you are in that challenge-seeking mode, though, you may engage in the operation. Be the first to comment on Eye In The Sky! Just use the simple form below. fullhyd.com has 700,000+ monthly visits. Tell Hyderabad what you feel about Eye In The Sky!